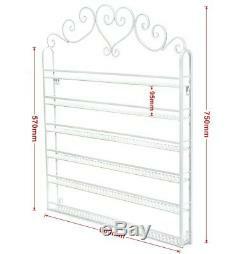 NEW White 60cm Wide 6 Tier Metal Nail Polish Rack ---- 60cm Larger Size. This wall mounted Nail Polish Rack is perfect for nail polish shop managing their nail polish in order. It's also a must have item for some nail polish collector store. It features in its simple and fashion design, strong heavy duty metal structure and large storage space. Suitable for nail polish shop, nail manicure & pedicure shop displaying the nail polish as well as home nail polish storage. Display your nail polish beautifully and efficiently: Never be in a hassle trying to find the right color nail polish mass. Simple and chic design also match different styles of shops. 6 Tier racks providing much more space displaying your nail polish, up to 120 bottles. 5.5cm depth of each rack allows holding many branded nail polish like Opi, China Glaze, Nubar, Essie. Made of heavy duty strong metal iron: will not be bent & Unbreakable. Spray Coated Iron: Enjoys a durable usage life. Separate Racks give more options of mounting ways on wall. Size: 60cm(W)x 5.5cm (D) x 75cm(H). 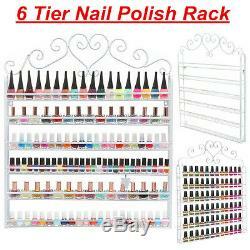 1X White 6 tier nail polish rack with assembly screws. Due to the difference between different monitors, the pictures may not reflect the actual color of the item. Compare the detail sizes with yours, please allow slight difference due to manual measurement. Sorry currently we cannot send items to below postcodes due to courier problem: AB, JE. The item "6 Tier White Wall Mounted Iron Nail Polish Display Rack Shelf Stand Organizer UK" is in sale since Tuesday, July 10, 2018. This item is in the category "Health & Beauty\Nail Care, Manicure & Pedicure\Nail Practice & Displays".